The Falabella is the Original miniature horse breed. It has been bred on the Falabella ranch in Argentina for over 150 years. The story of the Falabella horse began in 1845 when an Irish man named Patrick Newtall discovered that the tribes of pampas Indians had some unusually small horses. Newtall managed to obtain a quantity of Falabellas and by 1853 he had created a herd of small, perfectly built little horses of around 102cms. In 1879 he transferred his Falabella horse herd and knowledge to his son-in-law, Juan Falabella. Juan continued the experiment by using other breeds to develop this small horse. He bred the Falabella to the smallest English thoroughbreds he could find, Shetland ponies and Criollo, the Argentine horse of the pampas. In 1905 the Falabella horse herd was transferred to the next generation Emillio. In 1927 the establishment was inherited by Julio Cesar Falabella who kept careful genealogical records. He introduced the blood of several other breeds including the North American Appaloosa, which gave the breed it’s spotting, and the Hackney. Some time after this Julio began to sell a few Falabella horse’ to select clients and the late John F. Kennedy was one of the first people to acquire some. Mane – Short and straight. Falls on both sides of the neck. Unique Features: Unlike other horse breeds, the Falabella has seventeen vertebrae instead of eighteen, and one less pair of ribs. 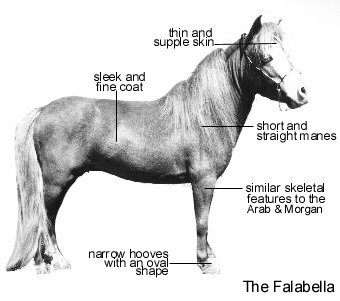 The Falabella’s heart is slightly larger in proportion to its body when compared to the standard-size horse. The Falabella Horse is linked to the earliest modern horse’s in the New World. The Spanish brought over Andalusian horses when they attempted to conquer the Americas, which were forced to fend for themselves when the would-be conquerors were forced to flee. To survive they had to undergo structural changes to cope with the variable climate of the pampas. Cold winds, strong sun and fierce storms are common. The land is arid and horses have to travel long distances to find pasture and water. 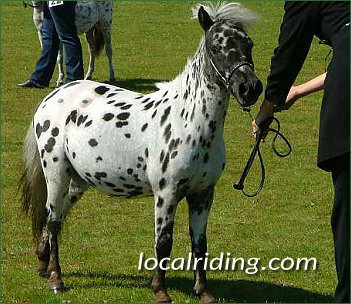 The Falabella is gentle and docile around people but retains plenty of fizz around it’s herd-mates. They are long-lived and hardy, coping very well with cold weather although most of them would appreciate some protection from prolonged spells of rain. Falabella Horses are bred in herds of ten to fifteen mares and a stallion. When the herd is established it is moved to open fields with other herds and strong family bonds keep each herd together as a unit. Mating occurs between the herd stallion and his mares. The presence of the stallion is respected by other stallions, so there is little or no fighting between herds. There is another breed of miniature horse in Argentina known as the Bergman. Remember that there are FAR more partbred Falabellas (with Falabella papers) than genuine Falabellas. These horses have some Falabella blood but ARE NOT FALABELLA. One society has imported a Bergman stallion believing it to be Falabella and have bred extensively with it. These foals have Falabella papers, but are not pure Falabella. In order to be certain of obtaining a genuine Falabella you can request that it be registered with the European Falabella Studbook before you purchase. They will ‘parentage qualify’ via a DNA test. The test can pick up non-Falabella horse markers in cases where it is impossible to parentage-qualify, for example if one parent has died. 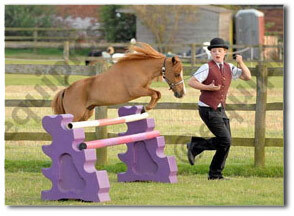 Be VERY suspicious if a breeder refuses to register a horse with them. Because of the large sums of money involved breeders are loathe to admit their horses are not genuine and not of 100% Falabella horse bloodlines. Unauthorized registries sometimes tell their members they can breed back to pure Falabella after five generations. This is UNTRUE – you NEVER get back to pure after the pedigree has been diluted.